Elisabeth Campbell, Amanda Witherspoon and Anna Gorman (left to right) discuss an inscription at a Museum Chat in February 2014. 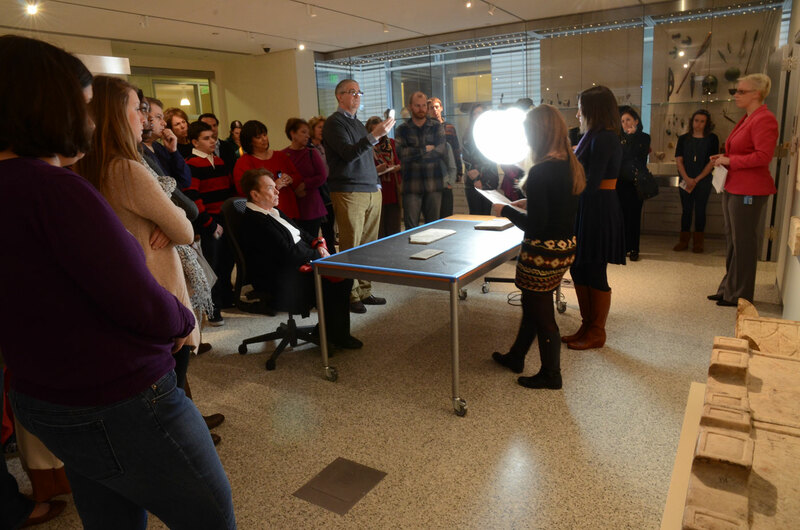 Beginning in 2012, two students from Garrison Forest School have come to the museum each year to work with Elisabeth Campbell, graduate student in Classics, to study and catalog Latin funerary inscriptions in the museum’s collection. Students with a strong background in Latin and an interest in working in a museum were selected by the school to work at the Archaeological Museum once a week over a course of a semester. 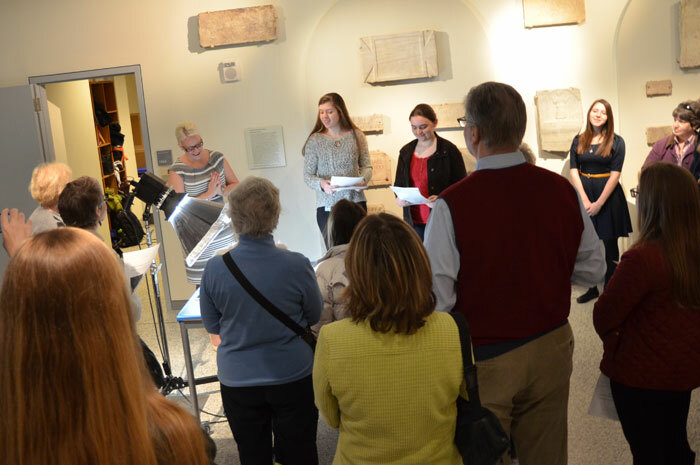 This joint project allows both for the training of high school students and a wonderful opportunity to examine and catalog the museum’s extensive collection of Latin funerary inscriptions, dating from the 1st century BCE to the 5th century CE. The inscriptions in the collection document the lives of men, women and children of many ages and from different time periods and social strata, offering a poignant glimpse into the past. Sarah Hill (left), Kaley Gonzalez (right) and Elisabeth Campbell (far right) discuss inscriptions in a museum chat in February 2013. This collaboration was made possible due to the support and interest of faculty and administrators at Garrison Forest. Dante Beretta, a JHU alumnus and Archivist and Latin teacher at the school, initially approached the museum with the idea of bringing particularly bright and dedicated students of classics to work with museum objects. The administrative and logistical aspects of this collaboration were made possible through the dedication of Andrea Perry, Dean of Special Programs.